The term Parliament coming from the French verb parler (to talk), means talking shop. This is significant because in representing people differences should be settled by discussion and debate rather than by violent conflict. Thus the institution of Parliament is the embodiment of quite politics, being devoted to parler – discussion. The Magna Carta of 1215 prescribed the condition for the king ‘to obtain the common counsel of the realm’ so that the business shall go forward on the day arranged according to the Council of those present. Through direct and indirect taxes, the people finance the running of the machinery of government. Therefore, people have a right to know how public money is spent. Accordingly, representatives of the people who are the Members of Parliament must understand and probe the implications of budget proposals, as Parliament has full control over public finance. It is also important to note here in summary form that all the three post-independence Constitutions in the country have shown some comparable provisions on the subject of finance. Accordingly, the provisions contained in the Soulbury Constitution concerning public finance has survived in both the 1972 and the 1978 Constitutions. The creation of the Consolidated Fund, into which all revenue flows and the Contingency Fund as part of the Consolidated Fund received Constitutional protection in all three Constitutions. These funds fell under the control of the Finance Minister, who was himself subject to Parliamentary control. The Finance Minister is prohibited from dealing with monies in either fund without Parliamentary approval. All three Constitutions recognized the position of the Auditor-General as an independent officer, whose tenure of office and salary was protected by the Constitution. Thus Chapter XVII of the 1978 Constitution follows Chapter XII of the 1972 Constitution, which was based on Chapter VIII of the Soulbury Constitution. Every administration in Ceylon (and in Sri Lanka) has taken the question of the control of Finance with due seriousness. Sri Lanka Accounting and Auditing Standards Act No.15 of 1995. Fiscal Management (Responsibility) Act No. 3 of 2003. Financial Regulations promulgated by the Minister of Finance. The Finance Act No. 38 of 1971 governs financial management of public corporations; The Central Bank of Sri Lanka approves accounting and auditing standards for financial institutions; the Securities and Exchange Commission oversees the Stock Exchange; Sri Lanka Accounting and Auditing Standards Monitoring Board monitors the application of accounting and auditing standards; Registrar of Companies administers the Companies Act of 2007. Fiscal Management (Responsibility) Act No.3 of 2003 was enacted with the objectives to enhancing the effectiveness and scrutiny of public funds with much more transparent and accountable manner. Reduction of Government’s debt to a prudent level and the budget deficit had been main targets among the other things. It also imposes the responsibility upon the Treasury to table Mid-Year- Fiscal Position Report in the Parliament for the evaluation by the Members and the general public as well. It will ease to make an assessment about any progress or shortfalls of the Government. But the factual position is that the Treasury as well as the Parliament appear to have disregarded the provisions of the said Act. Chapter XVII of the 1978 Constitution in its original form provides in Articles 148 to 154 for the subject of finance. The 1978 Constitution expressly provides in Article 148 that Parliament shall have full control over public finance. Moreover, no tax, rate or any other levy shall be imposed by any local authority or any public authority except by or under the authority of a law passed by Parliament or of any existing law. This Article embodies the fundamental principle of British Constitutional law that a subject cannot be taxed except directly by Statute enacted by Parliament or alternatively by resolution of the House of Commons passed by virtue of an enabling power in a statute. This principle had been referred to and acted upon as applicable law by the Supreme Court of Sri Lanka in the case of Illeperuma v Government Agent, Galle where H.N.G. Fernando C,J., held that the principle was applicable in Ceylon. As provided in Article 149(1), the funds of the Republic not allocated by law to specific purposes shall form one Consolidated Fund into which shall be paid the produce of all taxes, imposts, rates and duties and all other revenues and receipts of the Republic not allocated to specific purposes. Moreover as provided in Article 149 (2) the interest on the public debt, sinking fund payments, the costs, charges and expenses incidental to the collection, management and receipt of the Consolidated Fund and such other expenditure as Parliament may determine shall be charged on the Consolidated Fund. The withdrawal of sums from the Consolidated Fund is provided for in Article 150 of the Constitution. In terms of Article 150(1) save as otherwise expressly provided in paragraphs (3) and(4) of this Article, no sum shall be withdrawn from the Consolidated Fund except under the authority of a warrant of the Minister in charge of the subject of Finance. No such warrant can be issued unless the sum has, by resolution of Parliament or by any law been granted for specified public services for the financial year during which the withdrawal is to take place or is otherwise lawfully charged on the Consolidated Fund. This is subject to two exceptions (Article 150(3) and 150(4)). (b) Where the President dissolves Parliament and fixes a date or dates for a General Election the President may, unless Parliament has already made provision in that behalf, authorize the issue from the Consolidated Fund and the expenditure of such sums as he may, after consultation with the Commissioner of Elections consider necessary for such elections. Article 151 of the Constitution makes provision for Parliament to create a Contingencies Fund to provide for urgent and unforeseen expenditure. Accordingly, where the Minister of Finance if satisfied on the need for any such expenditure may with the consent of the President authorize provision to be made therefore by an advance from the Contingencies Fund. In terms of Article 151 (3), as soon as possible after every such advance, a Supplementary Estimate has to be presented to Parliament for the purpose of replacing the amount so advanced. While these provisions ensure that Parliament maintains vigilance over public expending it must be stressed that is the President who, as the effective Head of State and through the Cabinet of Ministers ultimately decides the manner in which public money is expended. Thus the Constitution expressly provides in Article 152 that no Bill or motion authorizing the disposal or the imposition of charges upon the Consolidated Funds or other Funds of the Republic or the imposition of any tax or the repeal, augmentation or reduction of any tax for the time being in force shall be introduced in Parliament except by a Minister and unless such Bill or motion has been approved either by the Cabinet of Ministers or in such manner as the Cabinet of Ministers may authorize. Thus it is the executive government which decides how to exercise the spending power which Parliament has conferred upon it. Parliament in maintaining ultimate control over public expenditure is assisted by the Auditor-General whose primary function is to police the administration of Parliamentary appropriations. Accordingly Article 153 and 154 of the Constitution provide for setting up of and duties and functions of this key post. The auditing function has been recently further strengthened by the establishment of the Audit Service Commission by way of National Audit Act No.19 of 2018. (b) any other matter referred to the Commission by the President relating to the Provincial Finance. As provided in Article 154R (5) the Finance Commission has to formulate such principles with the objective of achieving balanced regional development in the country having taken into account the matters set out therein. The President is also required to take action to lay before the Parliament every recommendation made by the Commission and moreover the President has to notify the Parliament as to the action taken thereon. ‘(c) three other members appointed by the President on the recommendation of the Constitutional Council, to represent three major communities, each of whom shall be a person who has distinguished himself or held high office, in the field of finance, law, administration, business or learning’. Under the 19th Amendment to the Constitution in 2015 Articles 153 and 154 have been amended. Moreover the following new Articles have been inserted immediately after Article 153 and shall have effect as Articles 153A, 153B, 153C, 153D, 153E, 153F, 153G and 153H of the Constitution. Among these new Articles is 153A by which Audit Service Commission has been provided for with the Auditor General as the Chairman of that Commission. Allocation of funds in the annual budget. Scrutiny by the Members of the Parliament at the stage of (1), ministerial consultative committees and (2) questioning from the relevant ministers, at the question time in the House. Re-scrutiny of expenditure at the Permanent Select Committee of Public Accounts (PAC) and of Public Enterprises (COPE). 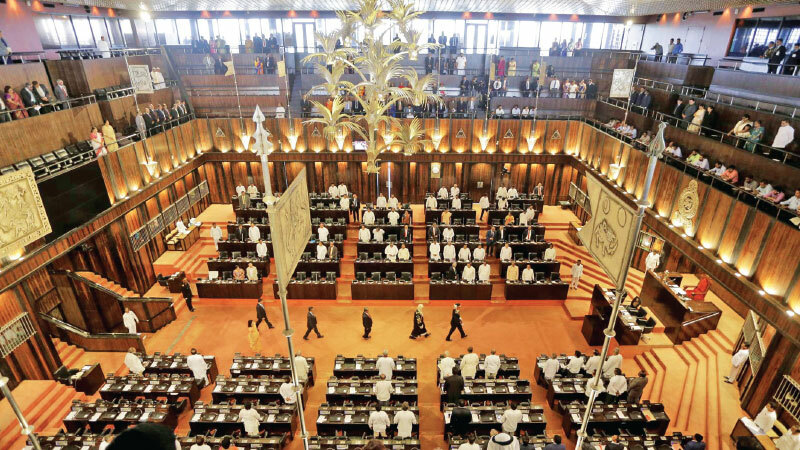 (Sri Lanka Parliament Standing Order Nos. 125 and 126). The allocations of funds for a particular Ministry shall be made taking into consideration the expected recurrent expenses and capital investments in the ensuing year. It is necessary to prepare all project feasibility reports and evaluation reports before any allocation is made for any project. Even the allocation of recurrent expenses shall be made after a proper evaluation on the impact of the economy. It is the duty of every Minister to hold responsibility directly to the Parliament about every cent spent by any officer or an institution which come within the purview of his/ her Ministry. The annual budget has to be passed by Parliament. The budget sets out the revenue and expenditure proposals allocating funds for all programmes and projects of the departments and state enterprises. Once the budget is approved, the Minister of Finance sanctions withdrawal under the authority of a warrant under his hand. Government agencies can spend monies only after this constitutional procedure is adhered to. No tax, rate or any other levy can be imposed by any local authority or any other public authority unless authorized by Parliament.